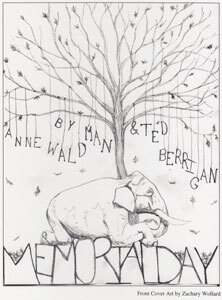 Funhouse Press’s reissuing of MEMORIAL DAY—orgiinally published by the Poetry Project, St. Mark’s Church In-the-Bowery, 1971—brings this classic collaboration between Anne Waldman and Ted Berrigan back into print in a stand-alone volume. The two poets alternate sections, incorporating lists, bits of dialogue, biography, and entire poems—one of Berrigan’s famous sonnets appears in its entirety—to engage with the topics of death and memorial (and a bunch of other things along the way). What results is a sequence that feels both vast and exquisitely specific, building up momentum until its final, climactic section. This edition also features a beautiful cover drawing by Zachary Wollard.